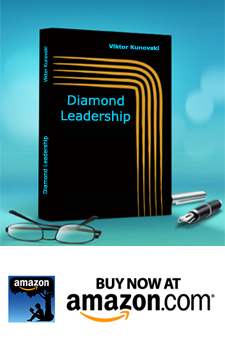 Home › DIAMOND LEADERSHIP BOOK › Key questions for creative dialogue – How to align your system? Good companies work with answers, excellent companies work with questions. If you ask the organization the right question, that is more powerful than the answers they already have. I would add to this that in the creative dialogue, there is no place for monologues. Because of this, one of the instructions given to the circle of participants in the creative dialogue, is to be aware and avoid falling into the trap of their own monologue, in which they would take up too much space and time. The opposite is also important, when people are not speaking and contributing at all. In the first case, people who talk too much in the circle are required to balance and reduce their monologues. In the latter case, those who participate less are encouraged to voice their opinions and balance their place in the system, despite any feelings of shame, the fear of mistakes, or the fear of being judged. The second goal, after the inclusion of all participants, is the creation of key questions which have meaning and importance to the team and/or organization at a given moment. Questions, as powerful tools for learning and development, have been used for centuries by wise teachers. Socrates was famous for his teaching methodology, based on good questions. He is known to have said: “I cannot teach anybody anything, I can only make them think“. Similarly to Socrates, one of the greatest minds and thinkers of the 20th century, Einstein, said: “The key thing is to not stop asking questions. If I have an hour to solve the problem on which my life depends, I would devote the first 55 minutes to asking the right question, because if I have a real question, I will solve the problem in less than five minutes”. How do we transform and innovate our national culture, our organizations and institutions? How do we improve the quality of life of our citizens? What kind of leadership do we need to do this? Contemporary psychology, especially modern coaching, pays great attention to the questions it asks. The coach is a careful creator of well-formed questions, whose primary objective is to create awareness and responsibility in the coachee or the coached team. John Whitmore, one of the fathers of modern coaching, says that coaching is actually creating awareness and responsibility in people and organizations; and the manager or coach, in the process of managing people, needs to be focused on creating these two qualities in them, which is done by asking key questions. Many coaches say that the manager who coaches by asking questions, and in this way includes and empowers people, turns from a manager into a leader. Let me give an interesting illustration that describes the impact of questions in the processes of thinking and answering. Think of a glowing object that freely falls from the dark sky – such as a lighting parachute slowly descending, attracted by the Earth’s gravity, and illuminating the space around it. Or shining fluorescent sticks, thrown into a deep, dark vertical well. In the same way as the shining parachute or fluorescent sticks, questions have the effect of being illuminators of the consciousness, expanding our comfort zone and stimulating an increased awareness in the processes of dialogue/inquiry. This is particularly true when we hold the question and allow the tension to work on us, rather than attempt to answer it straight away. At a group level, during the creative dialogue/inquiry, the effect of a powerful question on which the whole group is focused is multiplied; and the illumination of consciousness at a particular point happens throughout the system, affecting and touching all the participants involved. This is the moment of breakthrough (passing the threshold, entering the flow…). It is at this point of collective illumination that the group starts to think together as a whole. This is the place of unlimited creativity and innovation. “It is here that the system surfs on the wise winds of gods”. This effect was known to our ancestors and tribal leaders in America, or in the village in which Nelson Mandela grew up as a child. That is why it is important to carefully craft and select the key question. It must not be imposed, manipulated, or randomly selected by the executives or politicians. The key question needs to be “held” in the collective field, without being answered with rushed responses and/or activities. Similar to the koan practice in Zen Buddhism, the key question maintains the creative tension, and feeds the mind with curiosity. The difference between holding a question, and answering it quickly and reactively, is huge. If you answer the question, the creative tension will be gone, and the mind will cease to “quest” and be curious. Answering the question in a fast manner and taking immediate action is often the logical choice for managers; however, this conventional attitude leads to fire-fighting and repeating what we already know, which at the end gives the same old flat-lining results. In their book “The way of nowhere – 8 questions to release the creative potential”, Nick Turner and Nick Udal use eight breakthrough questions (as they call them), to release the creative potential in individuals and organizations. 1 What is my (our, for organizations) unique purpose…? 2 How am I (we) releasing the magic of the moment…? 3 How am I (we) venturing into uncertainty…? 4 How am I (we) focusing the power of my intent…? 5 How am I (we) supporting growth…? 6 How am I (we) learning to see the invisible…? 7 How am I (we) returning my/our gift…? 8 How am I (we) keeping my/our energy clean and bright? 1) We do not know the answer. 2) Alone, you can’t find the answer. For that, we need the co-creative power and intelligence of the group. 3) The question keeps you awake at night – it maintains your intent. 4) When you find the answer, you’ll change everything. Using the model of the seven levels of consciousness and the principles of creative dialogue, I have designed a question list that I simply call 7, which you can use as a platform for creating creative dialogue, and building a culture of alignment and innovation in your organization. Picture: “7 Levels of organizational Inquiry”, taken from the book Diamond Leadership.